“Some of them are in the executive arm of government, some of them are in the parliamentary/legislative arm of government while some of them are even in the judiciary. “Some are also in the armed forces, the police and other security agencies. What you have just read is a quote of President Jonathan's remark at that solemn event to honour the memory of our fallen heroes. The president till date has not arrested any member of this terrorist sect he eats and dines with because they are too close for him to prosecute. In fact, it will be an indictment of his government. Recently, the hidden secret as to the identity of one of the Boko Haram members in President Jonathan's camp was exposed when his Special Assistant on Social Media, one Reno Omokri, forgot to cover up his digital signature in one of his many cover-up stories to mask the activity of his sect. In a bid to cover up a massive scandal in the Nigerian National Petroleum Corporation where $20 billion was alleged to have been missing by the erstwhile governor of Nigeria's Central Bank, Mallam Sanusi Lamido Sanusi, Mr. Reno Omokri informed his Boko Haram sect to increase the "tempo" of their strikes so that he can conveniently link the whistle blower to the deadly sect. Alas, the diligence of some social media activists uncovered the sinister plot. 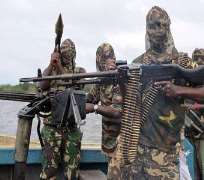 February 24th 2014: Borno State Governor's convoy allegedly attacked by gunmen. Malam Sanusi rose within the ranks, aided by his relationship with Mutallab, until he was nominated by President Yar'adua and confirmed by the senate as the Governor of the CBN in 2009. While Reno Omokri was writing this fictitious story, his sect truly intensified the "tempo" of their terror. You can find below some pictures showing Omokri's digital signature on word document shared to several publishing houses. It could also be recalled that when the former Minister of Aviation Stella Oduah was facing a terrible public outcry over the purchase of armoured cars at over-bloated prices, there were "increased tempo" of the sect's activities. Investigation reveals that the services of Reno Omokri's sect may have been employed to distract Nigerians from the scandals. Also, shortly after Justice Ayo Salami was removed on August 16 2011, there was public outcry and massive protest over his removal. If we are to go by the trend we have seen in recent times, Reno Omokri's sect was likely contacted to carry out the UN building bombing on August 26, 2011 just 10 days after Justice Salami's removal so as to distract Nigerians. I can connect several "increased tempo" in the strikes of Reno Omokri's sect to periods of public anger against his principal's regime. We call on President Jonathan to not only sack Reno Omokri, but also subject him to thorough investigation. The National Intelligence Agency, Department of State Security, the military and other sister agencies must conduct a thorough investigation of Reno Omokri's connection to the deadly Boko Haram sect. Anything short of this is a disservice to the 10,000 Nigerians who have been killed so far during the sect's activities. Anything short of this is a disservice to the memory of our gallant officers in the JTF, Military, DSS, Police and Civil Defense, who continue to sacrifice their lives that we may live in peace and freedom. Disclaimer: "The views/contents expressed in this article are the sole responsibility of Kikiowo Ileowo and do not necessarily reflect those of The Nigerian Voice. The Nigerian Voice will not be responsible or liable for any inaccurate or incorrect statements contained in this article."